It wouldn’t make sense to use a $5 metronome with a $2,000 Drum kit, right? With that out of the way, this gave way to a lot of manufacturers like BOSS, Tama, and a couple of other companies to step up their game and bring forth some of the best metronomes for drummers in the market. Learning to work with a metronome is crucial for any drummer because it allows the drummer to gauge his or her sense of time against the perfect time of the metronome. You definitely should pick one up as soon as you can. You’ll also need a decent pair of headphones or earbuds to use with your metronome. The first Metronome on our list is the BOSS DB-90, and for those who don’t know, the company’s BOSS DB series is perhaps one of the most popular series that is currently under metronome series, the company earned itself a lot of reputation among the most passionate and professional drummers. The popular BOSS DB-90 Metronome has everything a drummer would ever need. 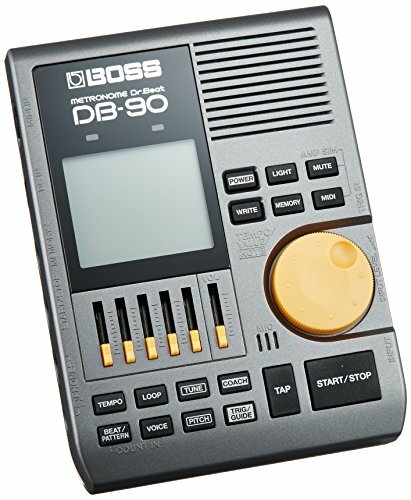 Before we begin looking at just how good the BOSS DB-90, there are some obvious things you should know about this metronome; the BOSS DB-90 is unique in a sense because literally every feature is adjustable: including subdivisions, programmable time signatures, clave patterns, and sounds. It comes with four different click types, including a human voice count, which an awesome feature for keeping track of the down beat. 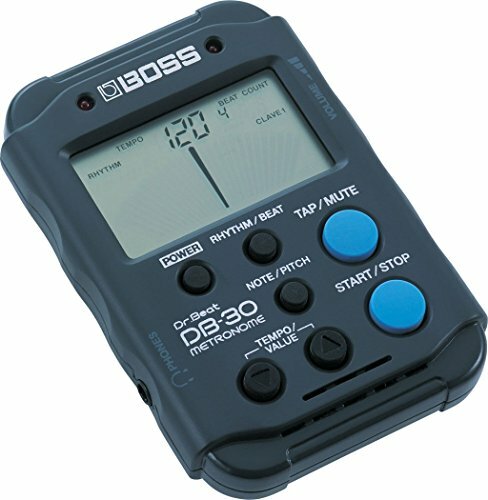 Our only issue with the BOSS DB-90 Metronome is that it should have been available with adapter Power adapter sold separately. behind the expensive price lies a really good metronome that fits musicians of all sorts, it doesn’t matter if you are playing a drum, guitar, Bass, the metronome is there to serve, and serve you well. Another good thing is that these metronomes offer a great integration of MIDI, meaning that features such as beat programming and more will be possible to play with. We would like to point something concerning the display, we thought that The “Light” button only lights up the display for a few seconds, then you have to press it again. but after research, we find out that you can make the light stay on by holding the Light button down when you first power up the unit. Remember any metronome will help you, but an advanced one like this can optimize practice. Tempo range from 30-350 bpm. This metronome comes in a pretty basic enclosure and it is Well designed. Apart from just design, the metronome can handles time signatures up to 17 beats per measure, and also support adjusting the tempo you can easily change how many beats, which beats are sounded, and choose more complex rhythm combinations(e.g., 6-7, or 4-3 time). Another good thing is that the metronome comes with a headphone jack so you can practice with a kit and hear the click or practice silently with rubber pad. Cannot be powered with an AC adaptor. The first timekeeper designed specifically for the band’s timekeeper, TAMA’s Rhythm Watch has everything a drummer needs to make sure they stay on tempo-live and in the studio. if you like DB 90C but you’re confused by its multiple and advanced functionality and you want something with a few more features than the cheaper versions, this metronome is for you. TAMA has done a great job keeping everything as minimal as possible. 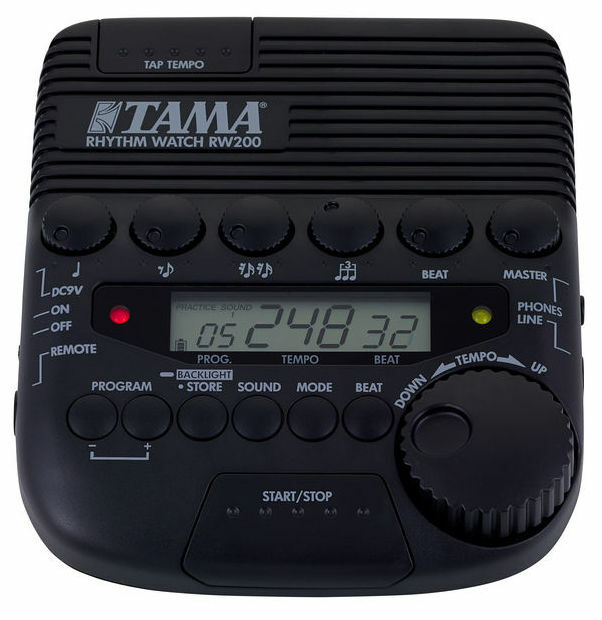 most drummers should be able to recognize TAMA Rhythm Watch because it has been around for a long time, the rhythm watch is powered by a 9-volt battery, but can also be plugged in with a 9V power adapter (not included). The RW200 it’s perfect for gigs & rehearsals . You can program in the tempos of the entire set list (up to 30 tunes), then, using a footswitch, advance to the next tune. With a dual-button footswitch, you can start & stop the click and advance to the next tempo/tune. It also has “stage” mode where the click turns off after 4 bars. The best part about having this on set and in rehearsal is: no more discussion or guessing about a tune’s tempo. Another great thing is that the rhythm watch has a backlit display yes, you can set it so it lights up when you press buttons, or have it off all the time to save battery. It also has two lights that blink green with the beat, and blinks red at the first beat in a pattern(for example, if you set it to 7/8’s, it blinks red at every 7th beat), if you feel more confident seeing the beats as well. Last but not the least, the Tama Rhythm Watch has a foot pedal switch that allows you to cycle through your presets. 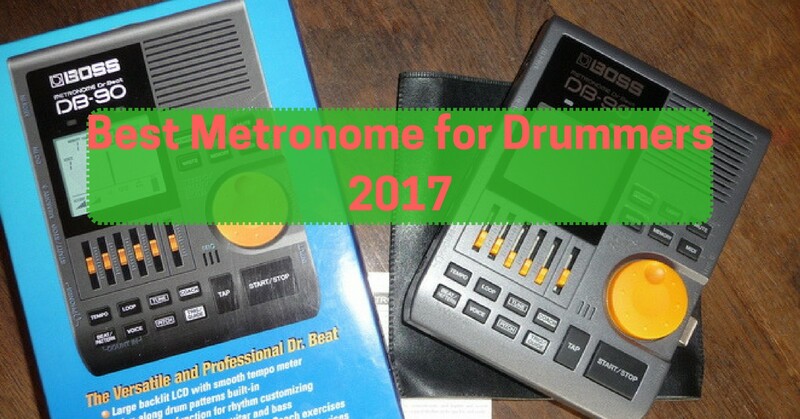 Overall, while you can’t do everything with this metronome, it is much easier to use and understand than the DB-90, and costs half the price. additional attachment essential for mounting(Tama Rhythm Watch Holder ). 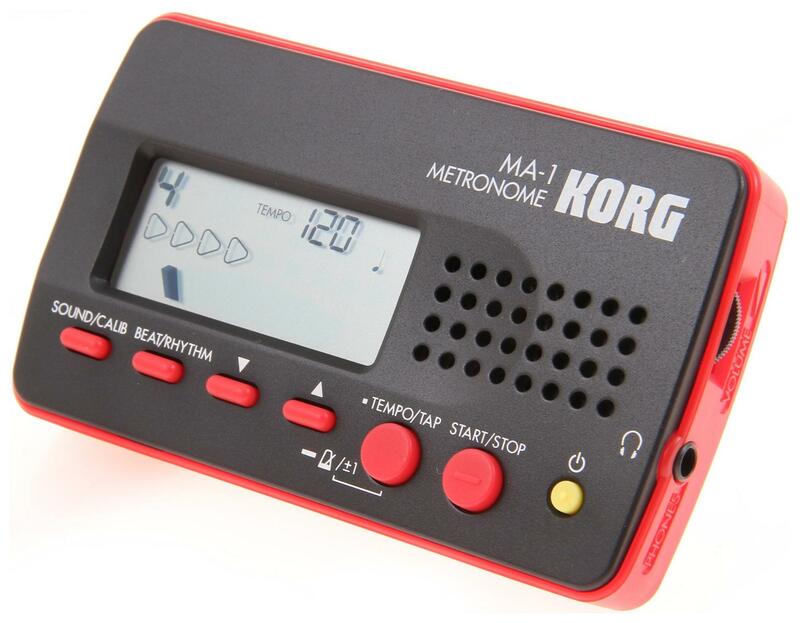 This is one of the most popular metronomes, if you’re a musician I’m sure you have seen the Korg MA, because of its small, compact, and portable size the Korg is perfect drummers that are frequently on the road. but you probably don’t want to drop this thing too many times. Now the good thing here is that Korg has decided to follow a rather simple suit instead of being all out fancy; simple design with only the essential features. Moving on, the metronome features a few different subdivision options including swing eighth notes, tap tempo, adjustable speed and volume control, and a headphone jack. Another good thing is that this metronome comes with 13 different rhythms are built-in, meaning that you can practice to more than a click track. Overall, we think the BOSS DB-90 Metronome is the best choice for beginner & advanced drummers, because of its good sound, comfortable wide design, and a generous amount of included functionalities. If you’re not sure which metronome you should be using, BOSS DB-90 is definitely the one. If the BOSS DB-90 is unavailable, the Boss DB-30C costs a little more but offers a nicer fit and finish and similar functionalities and playability. Beginners who crave the smaller size of a Boss DB-30C should first consider the TAMA Rhythm Watch RW200; for something a little less traditional or more affordable (or if the TAMA Rhythm Watch RW200 sells out), we recommend the Korg MA-1. Best Electronic Drum Sets And Brands!